Sometimes, when someone is open to it, the universe presents answer to life questions. Nick Morgan and Casey Kalista spent a night in March wondering if they had a future in Nederland, or if it was time to move on. The next day, long-time Happy Trails owner Randy Ruhl serendipitously decided Kalista was the “right person” in a years-long search to sell the business. 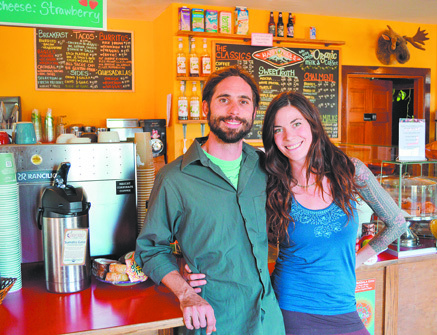 By July, the couple had bought the coffee shop and fulfilled a dream. Kalista started a love affair with coffee while still in high school working at a Marshall Field’s Department Store in her home state of Michigan. “One morning the Starbucks personnel didn’t show up. I was the only one there and there was a line of people wanting coffee. I was like ‘OK, let’s do it.’ I just started figuring it out. Lord knows if any of those were any good, but that’s how it started.” She went on to work for Starbucks and stayed with the company when she moved to Chicago where she helped open stores as a supervisor. “I worked my way up through the crazy bureaucracy of that company and realized corporate coffee was not what I was interested in—but, I loved coffee. I loved making it. I loved the interactions you have with people. I just really liked the environment.” After burning out on the corporate culture, Kalista left the company and began working various random jobs before finding herself on vacation in Prague, Czech Republic. The weeks-long trip turned into a four-year stay where she got back into coffee thanks to a pub job. Kalista moved directly to Nederland, where her sister lived, from Eastern Europe and found a job at New Moon Bakery, serving coffee among other things. When that job ran its course, she went to work at an aerospace engineering company, but she couldn’t do it. She came back to Nederland and started working for Ruhl. “I’ve tried a lot of other things in last 10 years, and just keep coming back to coffee,” she said. It took some time for Morgan to decide it was the right move as he is just finishing his undergrad degree at University of Colorado, Boulder this December. His schoolwork is what brought the Iraq War veteran and Vermont native to Boulder and, ultimately, Nederland once he found he and his dogs needed a little “elbow room.” He began to develop a relationship with Kalista by making routine trips to New Moon for coffee. The business is now known as Happy Trails Café and no longer has a bike shop in the back. There is now plenty of room to find a cozy spot throughout the building. They have expanded the menu that was strictly burritos and pastries. “We’ve added tacos, quesadillas and other platters—kind of Mexican street food,” Kalista explained. Since taking over, Kalista has done a lot of work on the equipment to “get it up to where it should be.” Eventually they like to purchase new equipment, but it’s just not in the cards as a start-up. “We’ve definitely made improvements with the coffee in how it looks, how it pours, everything,” she said. Happy Trails is located at 98 Colo. 119 South. in Nederland. Call 303-258-3435 to learn more. Tags: Conscious Coffees, Happy Trails Café, Nederland. Bookmark the permalink.